ELLIJAY, Ga. – With confirmation of roads in and around Ellijay and East Ellijay, the Gilmer County Sheriff’s Office has issued a statement for drivers. Gilmer Dispatch, deputies, and city police officers are reporting that several of the main roadways in town, as well as others throughout the county, are beginning to flood. The Sheriff’s Office has suggested you stay in if possible, but if you have to drive, they ask that you please be on the lookout for standing water in the roadways. DO NOT attempt to drive through roads that are under water! This rain is in our forecast for at least the next 2-3 days, so we expect there is a possibility that the flooding on the roads may get a lot worse before it gets better. At this time, Gilmer county remains under a Flash Flood watch until at least Thursday evening. ELLIJAY, Ga. – With only one night into what is expected to become a week long surge of rain and storms, Gilmer County has seen debris and trees down on several roads. While authorities are urging care and caution in citizens, the Publis Safety Department and Sheriff’s Offices are both continuing warnings about flash floods, high winds, and dangerous conditions that could last until Saturday. A Flood Watch remains effect through Saturday morning for portions of north and northwest Georgia. As a result of multiple periods with heavy rainfall, some localized flooding of creeks and streams may be possible across portions of northern Georgia. Additionally, even Gilmer County Schools representatives have reported delays in bus routes and travel because of the debris and trees the county is already dealing with on their roads. They are asking parents for patience today as drivers are navigating these roads and conditions. Parents should not be concerned if students on buses arrive home a few minutes later than normal. Please be patient as some bus routes may run slightly later than normal as our drivers exercise extreme caution in transporting our students this morning. Amicalola Electric company is also reporting major outages in the area as they continue dealing with the storm. With 107 outages, they have reported close to 4,000 homes without power today. While much of these outages came in the area of Talking Rock and Highway 52, there are others affected all over the county. Crews are currently attending to these and working to restore power as quickly and safely as possible. Wind gusts of 20 to 30 mph will be possible through the rest of the day for portions of northern Georgia. These enhanced wind speeds combined with extremely saturated soils from the persistent rain have resulted in conditions very susceptible for trees to become uprooted and blown over. Trees may be blown onto structures, roadways or powerlines causing further power outages across the area. UPDATE: The Sheriff’s Office reported Fendley found and safe on February 18. 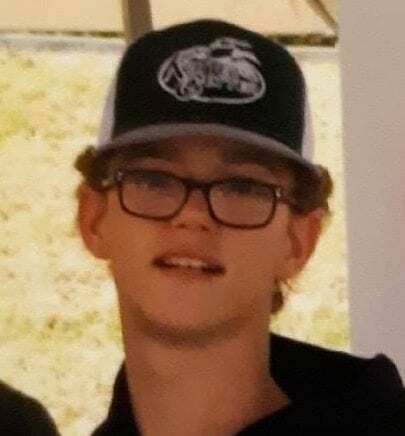 Have you seen DAKOTA FENDLEY or know of his whereabouts? Dakota is 16 years of age and was last seen on foot in the area of Harold Pritchett Rd. Saturday, Feb. 16th, at approx. 5:00pm. He was wearing a black hoodie, blue jeans, a gray hat and black glasses. 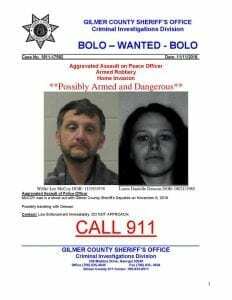 If you have information, please call Gilmer County Dispatch at 911 or 706-635-8911. 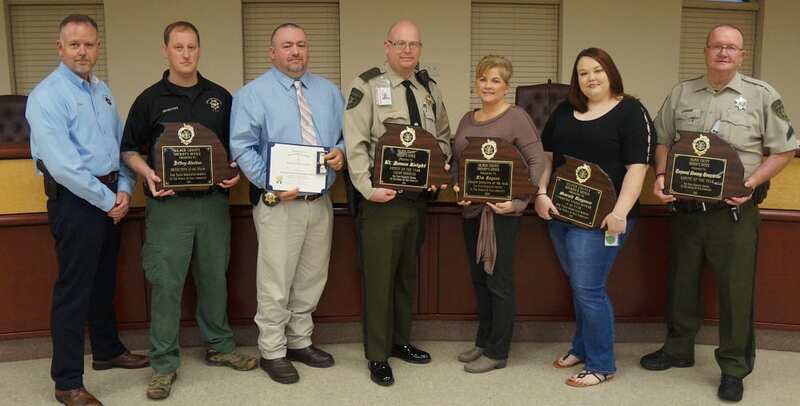 ELLIJAY, Ga. – “It’s easy to stand up and be the leader of an agency that is doing so much positive every day,” said Gilmer County Sheriff Stacy Nicholson on February 7, 2019, as he honored members of his staff. 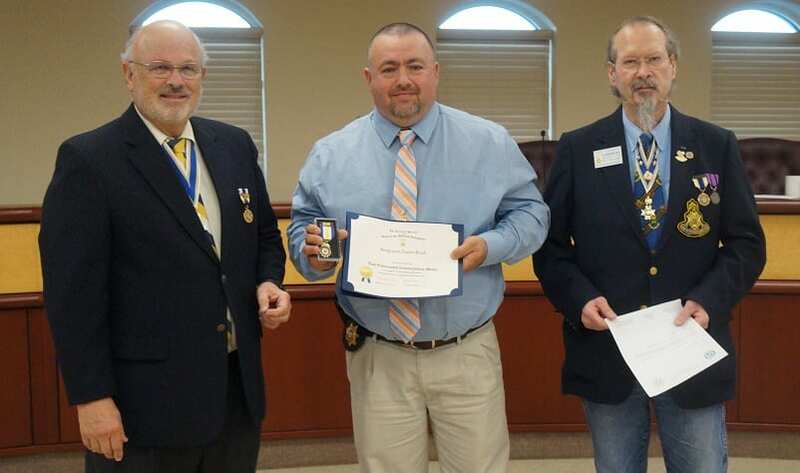 The awards night saw several GCSO employees and even some officers from Ellijay Police Department honored from recent events. Nicholson went on to note that discussions and debates among the Command Staff for these awards is one of the hardest discussions he has. He said that so much has changed since he started his time as Sheriff. With increasing issues and dangers in the profession, he took extra effort to express how much he cares and concerns himself over protecting the safety of officers as they perform their duties. Sid Turner (right) and Jared Ogden (left) present the Sons of the American Revolution Commendation Medal to Sergeant Jason Reed. The first award came with from Sid Turner and Jared Ogden of the Sons of the American Revolution who presented their Sons of the American Revolution Commendation Medal to Sergeant Jason Reed. Sheriff Nicholson presented the remaining awards for the Sheriff’s Office. 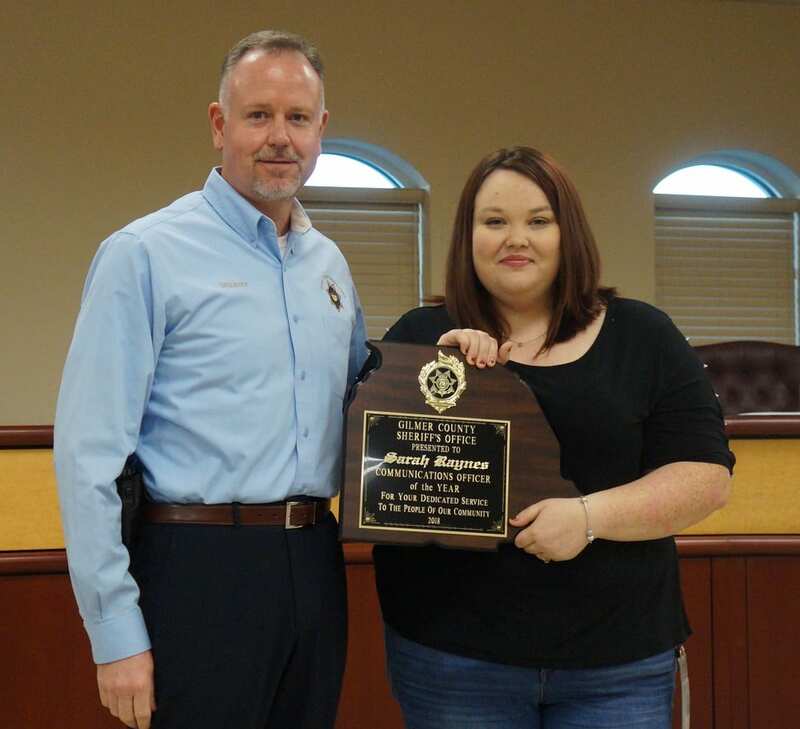 Sarah Raynes received the Communications Officer of the Year award. Nicholson commented on how upbeat and energetic she has been in 2018 including a jarring move from day shift to night shift to fill a need in the department. He went on to note that her attitude throughout all of the positions hardships and trials makes her a pleasant dispatcher and great worker. 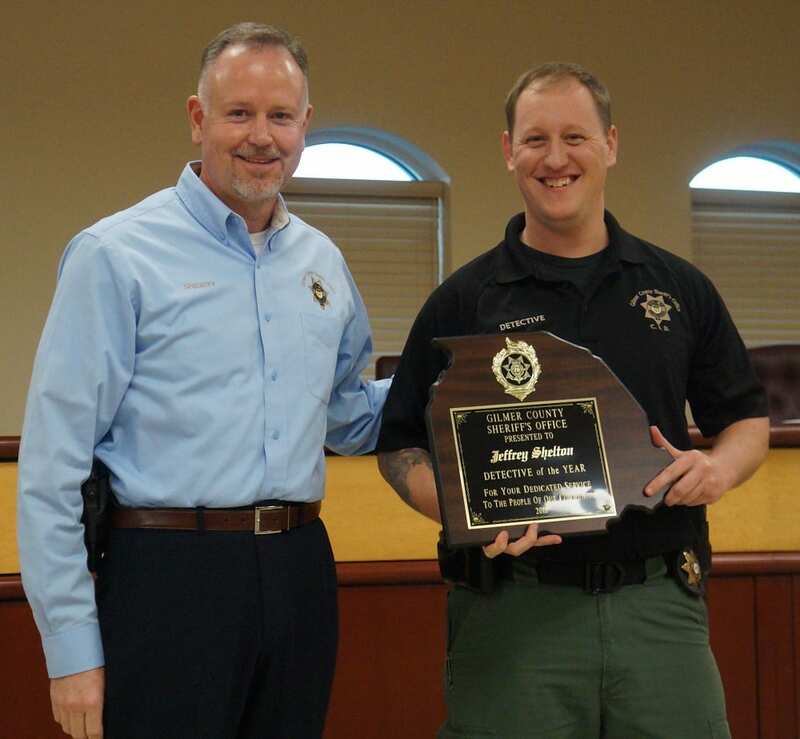 Detective Jeffrey Shelton received the Detective of the Year award. Nicholson shared the words he received about Shelton saying it was his tenaciousness and his attitude as he was assigned several cases that blew up into much larger ordeals than originally expected. Through these cases, he continued his efforts, “sticking with it” as Nicholson stated. In a position like Detective, Nicholson said certain cases can be very easy. But, in one day, they can become an investigation spanning several generations. Corporal Tommy Humphries received the Deputy of the Year award. Nicholson spoke about Humphries’ specialized talents as Deputy able to go to neighbors dispute, mediate the process, settle the issue, and be invited back for coffee later. The effort and the nature of a person required to see that kind of success in the role of Deputy is an indispensable member of the office. 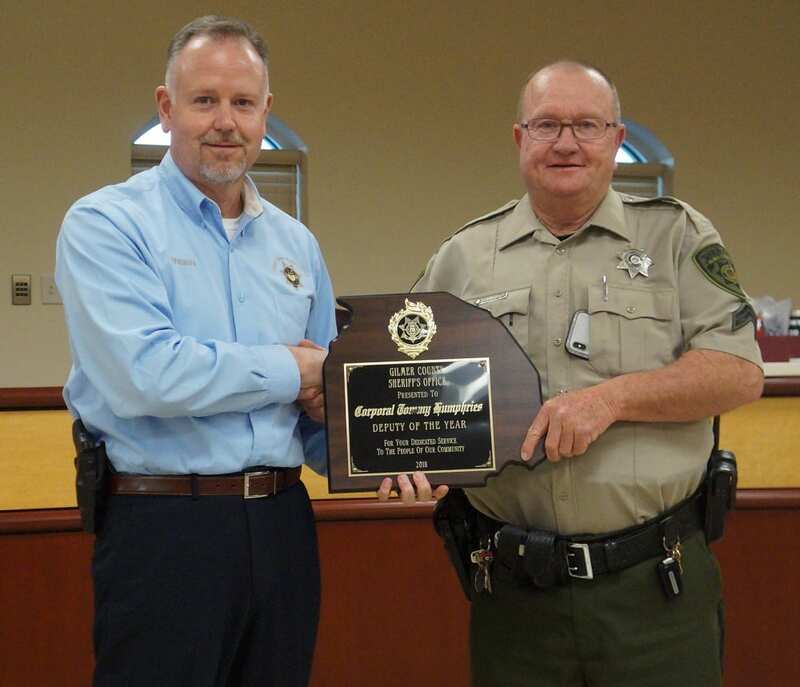 Lieutenant James Knight received the Court Services Deputy of the Year award. Nicholson stated that most people don’t understand all the work that goes in to being a Court Services Deputy. With issues that arise from short notice events, securing the courthouse, checking between 400 and 800 citizens a day as they enter the courthouse, logisitcs issues with ID’s and courts, these deputies must be flexible and responsive to the special needs of their post. Lt. Knight does this with ease as he attends to the daily issues in the courthouse. 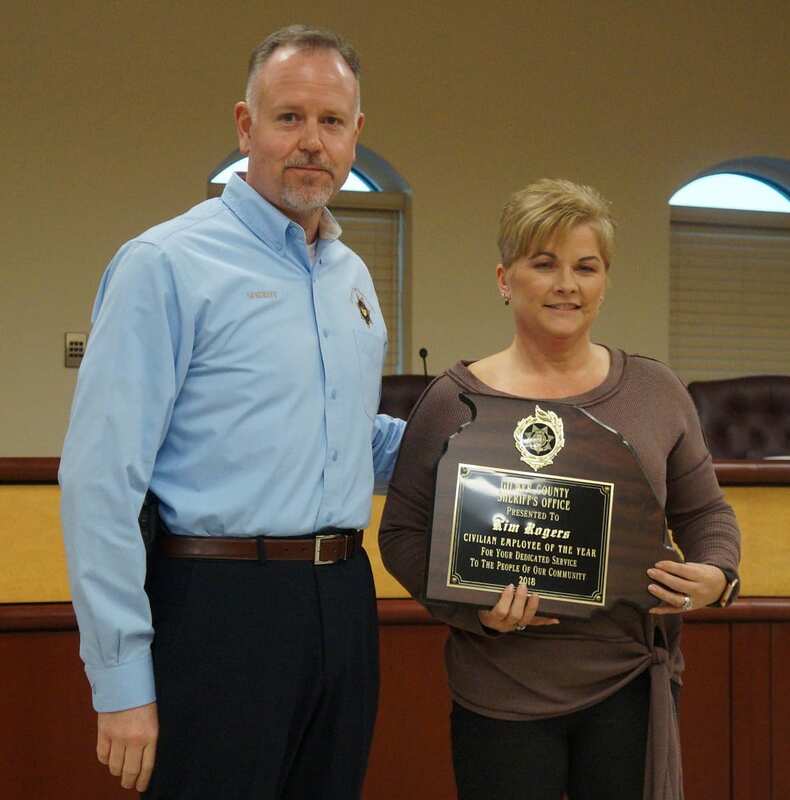 Kim Rogers received the Civilian Employee of the Year award. Nicholson went on to note the Rogers came to the Sheriff’s Office to fill the gap of a big role. She took the spot to a new level in everything she keeps track of. He noted the extra work she has taken in since joining the office and rolling with everything asked of her. 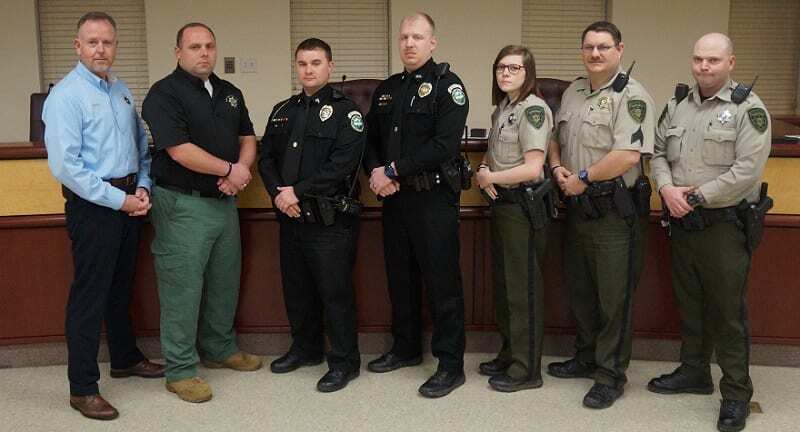 From left to right, Sheriff Stacy Nicholson, GCSO Lieutenant Joshua Chancey, EPD Sergeant Aaron Mashburn, EPD Officer Trevor McClure, GCSO Deputy First Class Lesse Sippel, GCSO Sergeant Daniel King, and GCSO Corporal Gene Hefner. The final award of the night actually hosted several officers and deputies as Nicholson presented Combat Citations along with a ribbon, to be worn on their uniforms, for those involved in the November 6, 2018, incident. Those receiving the Combat Citation included Ellijay Police Officer Trevor McClure and Sergeant Aaron Mashburn and Gilmer County Sheriff’s Office’s Deputy First Class Lesse Sippel, Corporal Gene Hefner, Sergeant Daniel King, and Lieutenant Joshua Chancey. There were also two awards not delivered as the recipients were not available at the time of the awards ceremony. Kurtis Parks received the Detention Officer of the Year award. 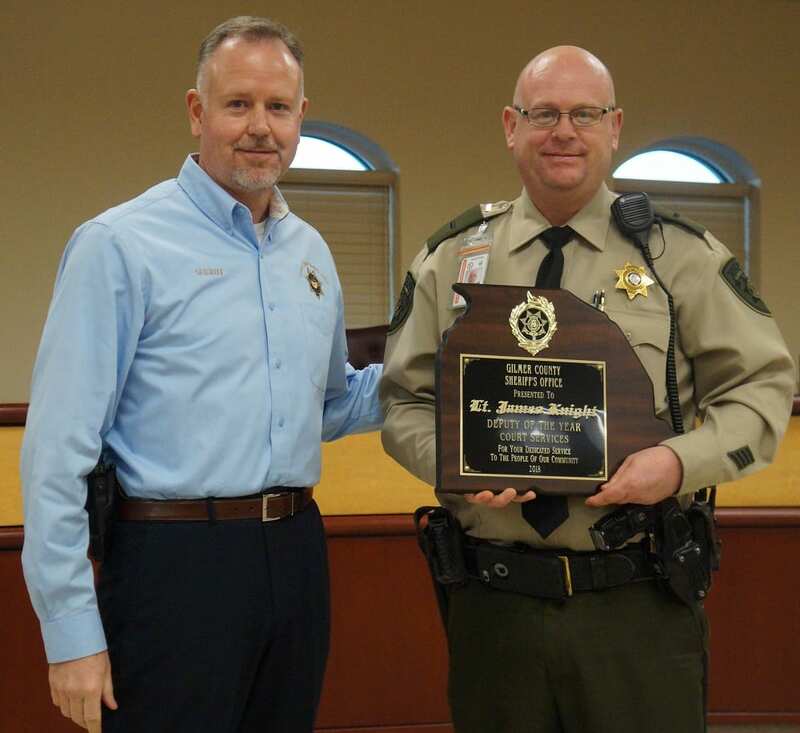 Deputy Joshua Easley received the Student Resource Officer of the Year award. 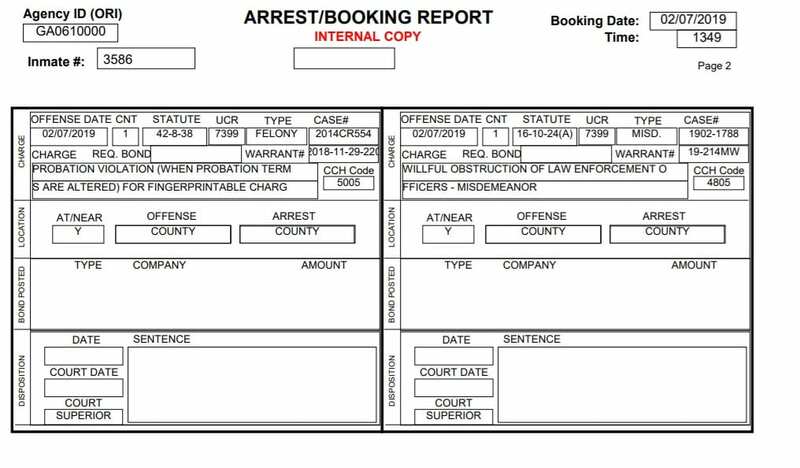 ELLIJAY, Ga. – Yesterday’s events saw two arrests at Rose Court when Michael Kevin Pro and Sean Robert Joannides were taken into custody. 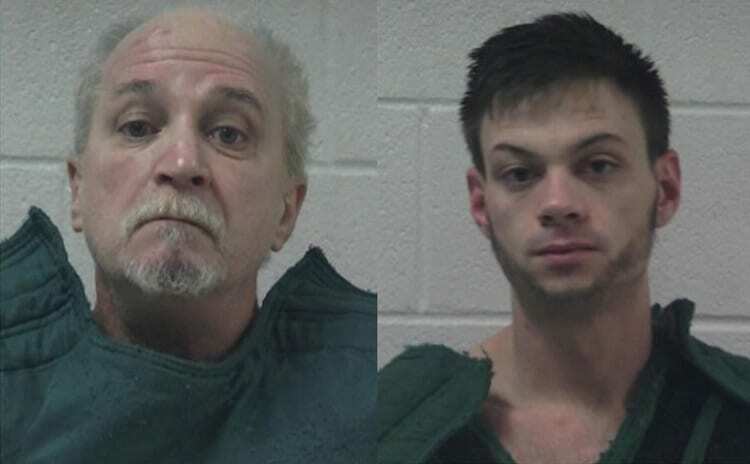 Through a joint effort from the Gilmer County Sheriff’s Office and Cherokee SWAT team, the two men were arrested after barricading themselves inside the house. Joseph David Cain is a third suspect still being sought by authorities as well. 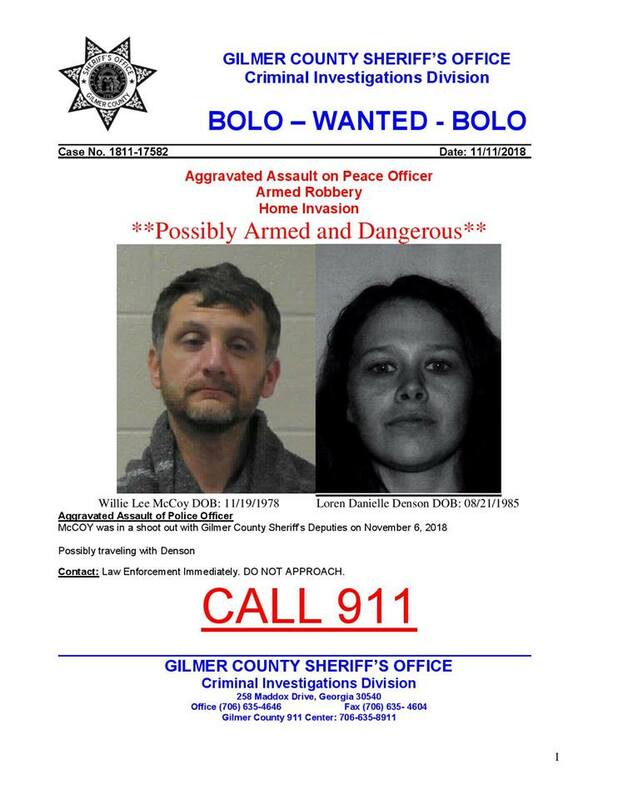 Pro and Joannides are currently in custody and the Gilmer County Sheriff’s Office has released the booking reports for each. 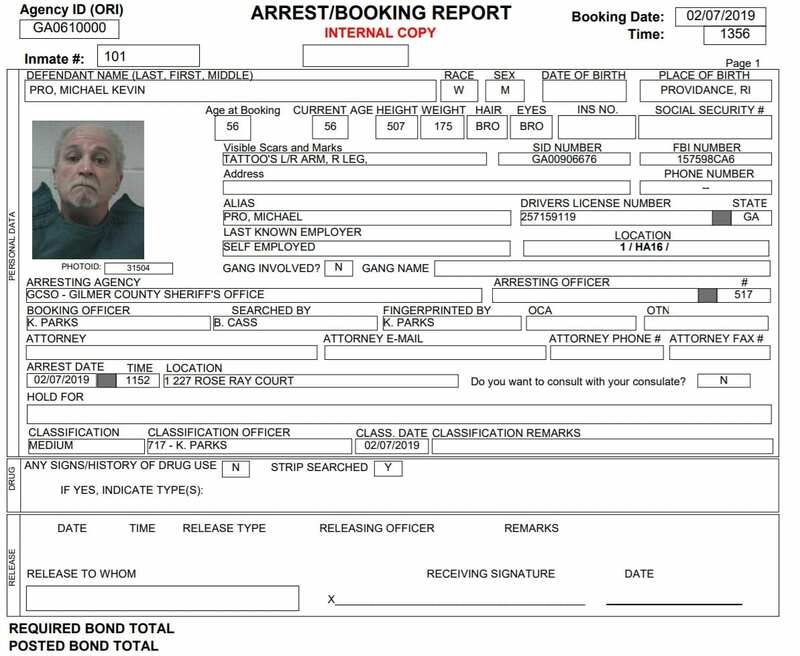 Michael Kevin Pro faces felony charges of Probation Violation, as well as a Misdemeanor Willful Obstruction of Law Enforcement Officers, according to the arrest records. 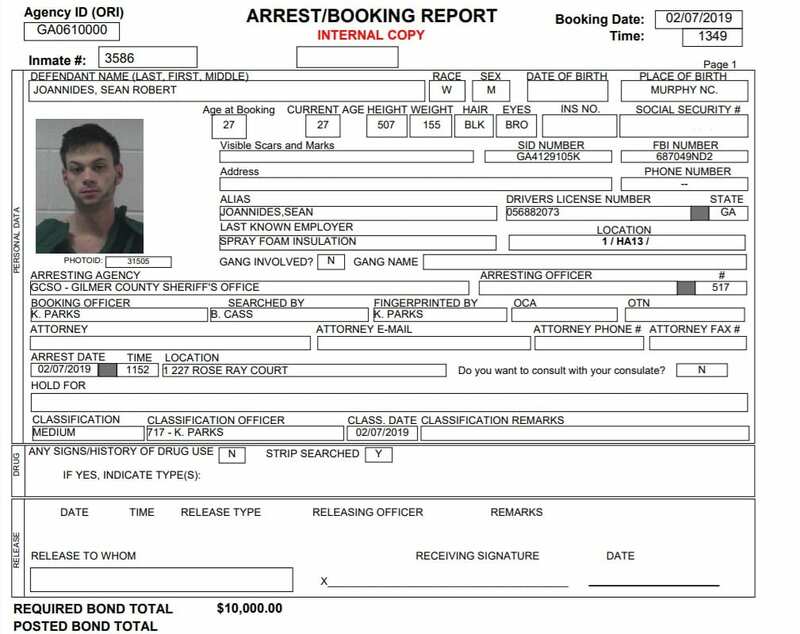 Sean Robert Joannides faces charges of Burglary and felony charges of Probation Violation, as well as a Misdemeanor Willful Obstruction of Law Enforcement Officers, according to the arrest records. ELLIJAY, Ga. – The suspect of a home invasion last week, Willie Lee McCoy, was shot by law enforcement during the incident, but has now escaped custody at the hospital where he was being cared for. According to Gilmer County Sheriff Stacy Nicholson, McCoy was incapacitated and under heavy medication as he was life-flighted to the hospital for his injuries. Nicholson states he was kept under guard by the Gilmer County Sheriff’s Office for 18 hours. During that time, Nicholson says he was assured multiple times by the hospital security that they would monitor and guard McCoy and would inform the Sheriff’s Office when he was being released. However, over the weekend, he got out of his bed and walked out the front door of the hospital. At this time, his whereabouts are unknown. The Sheriff’s has notified those involved in last weeks incident about the escape and is currently looking for him. They are also looking for Loren Danielle Denson. Nicholson said that the Sheriff’s Office is only seeking Denson for questioning at this time as they believe she may have information about McCoy. He asserted that the office was only seeking Denson as a possible connection at this time. The Sheriff’s Office is asking citizens to be aware of the situation and is asking anyone who spots or has information on McCoy to contact law enforcement immediately. 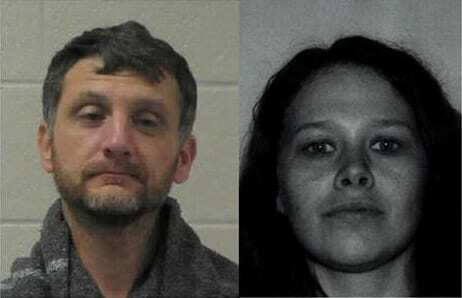 They are asking citizens not to approach these two, but instead call 911 if you spot them. McCoy is expected to still be affected by injuries to his hip and arm and that one of his injuries would be in need of follow up treatment. According to the Sheriff’s BOLO McCoy is wanted for charges of aggravated assault on Peace Officer, Armed Robbery, and Home Invasion.